Having few years of experience in dealing with coconut oil millers and merchants. 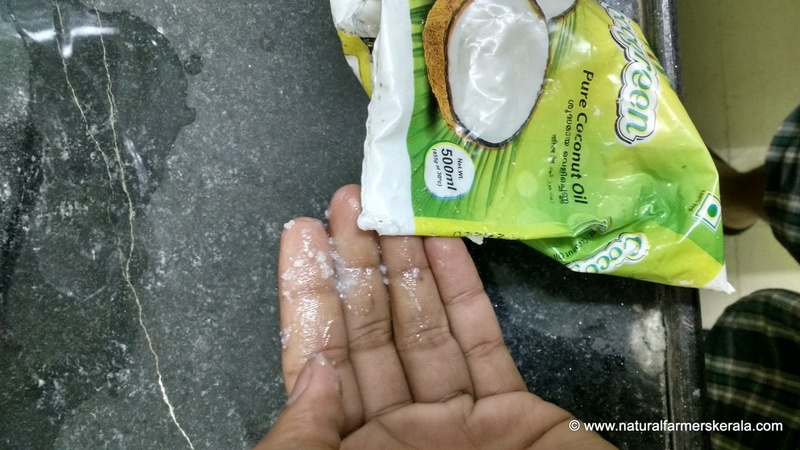 Adulteration of coconut oil is widespread. Some of the common forms of adulteration in Coconut oil. Palm Kernel oil: It is very difficult to distinguish between coconut oil and palm kernel oil as they have some similar texture. Palm oil and palm kernel oil is not good for you neither for the planet. Thousands of hectares of richly diverse and dense tropical forests are destroyed for mono-cultivation of palm for oil. As per a survey, 90 percent of the consumable products in the shopping malls are made using palm oil. Argemone oil & Cotton seed oil: Argemone is a Mexican weed which contains toxic alkaloids and produces an inedible oil. This does not deter many oil brands from using this to adulter. Cotton seeds (GM) too account for almost 13 percent of total oil consumed in India. There are many other cheap alternate oils. Most small mills make good oil which is sent to big merchants. This goes to big warehouses and stockists who adulter them then clean and pack. Now it’s ready to be dispatched to small towns, cities and even most villages in Kerala with branding. Cotton oil is being sold and used which is violation of Indian laws. Genetically modified food has not been cleared for human consumption in India. Paraffin: It is widely used by many top companies until few years. Illegally it is still used by many merchants as a substitute to coconut oil or mixed like palm oil. It is highly hazardous to health. Increase oil by volume: Synthetic chemical is added where by 1 liter of oil increases it’s body to 1.1 liter. This is done since oils are sold by volume in India (not by weight). I am yet to find out as this was tipped by a person working with a nearby mill. Mill owners will deny the fact; and keep it top secret. Hexane: This is a popular solvent used to extract maximum oil from any oil seed. This is also toxic to humans. Because of subsidies and market monopoly it seems impossible for small oil mills to compete with larger mills that use solvents to extract maximum oil. Bleach: Traditionally, oil mills had a constant stream of customers. The modern day industrial oil mills however create produce in excess and rely on packing and shelf life to reduce cost. Small players lost their share of business as a result. So oil started piling up at local ghanis and mills. Also for big players cleaning the equipment’s is a loss of production hours. Why worry when there are cheap alternates to clean oil? Old oil trapped in the machines become rancid after a few days and then it mixes with new oil which too is spoiled. So, bleaching, filtering and using chemical preservatives became part of the process, small mills after producing oil sell it to middle man which ultimately reach to big stockist. Filtering: Filtering is essential nowadays because oils are produced in unhygienic and unsupervised places, oil is also stocked and mixed with other cheap alternates. Filtering filters out everything. The good is lost on account of the bad. Filtering takes away the nutritional value of the oil. Deodorize: This is again done because after the oil is filtered to the core like water, there is nothing left in oil. It’s just grease. So it needs an infusion of aroma and flavour. Approved chemical substitutes is the answer once again. Fungus: Molds (fungal growth) are one of the biggest problems with copra (dried coconut) and peanut. Coconut is full of moisture if it doesn’t dry well; it starts to have fungal growth. Most traditional oil mills would never use this type of coconuts as the oil will be inferior and smell rancid. Nowadays since there are modern cheap alternates like bleaching, filtering and pasteurization. Mills accept this type of coconuts at dirt cheap rates and mix all nuts together. Engine oils: Yes my dear friends, cheap dirty oil from any source can be (and is) re-filtered, re-packed and re-sold. I assumed that this type of oil would mostly be used for lighting lamps and other inedible needs. Nonetheless, these type of oil too find their way into our food grade oil. Did you know many of the VIRGIN OLIVE oil that you find on the supermarket shelves are fake? It’s sunflower and/or soybean oil mixed with adulterants. Unlike any other oil; olive has received so much of media hype that it is now a $1.5 billion industry in the US alone. As per most experts it’s really difficult to tell real olive oil from a fake one based on taste. 70% of virgin olive oil is adulterated and this was in the year 2008. Some 400 Italian police officers conducted a large investigation code named “Operation Golden Oil”. If this is the case in Italy, one can only imagine how so much virgin olive oil gets imported to a developing country like India. Bran oil is making headlines and many health freaks are praising it because of its health benefits and high smoke point. Traditionally only seeds rich in oil were considered good for health and sustainable. Bran oil weighs only 12% of the rice bran raw material (some studies put the figure lower than that). The extraction process requires solvent and also bran be heated above hundred degrees Celsius; a very energy-inefficient alternative. I prefer sesame oil first since this is the only oil that can penetrate till your bones and nourish it. However this oil raises the internal temperature and hence must be consumed taking into consideration the climates, seasons and one’s personal metabolism. Next good option is coconut oil which is healthy, cheap and naturally grown at least in some parts of the world unlike other crops grown on commercial scale. For good oils check your local area or on outskirts of towns and buy from small mills. All you need to do is repack in a glass bottle or wide mouth steel vessel, add couple of pinches of sea salt or black pepper corns and expose it to sun for one day. This preservation technique is still followed by the purists in my neighborhood. Pure coconut oil is divine. please check this video by one of the renowned Indian medical scientist and cardiologist Dr. B M Hegde. Retired Chancellor of the Manipal University. Palm oil and Palm Kernel oil is different. As you mentioned, most of the coconut oils available in the market is mix of palm kernel oil and coconut oil. It is color less and order less and neutral in taste and dead cheap (At the cost of nature and health millions of people). If you mix palm kernel oil with coconut oil it is hard to distinguish even using scientific methods.